New River Dining: The (NCT) human pyramid. And a little pancetta. Some groups arrive... eat... drink... enjoy themselves... maybe a little shimmy... and exit with me pondering what can be the focus of that night's blog. With other groups the focus is rather more obvious. We've often had dancing but never before have I witnessed gymnastics. Lizzy, Nikki, Kate, Roxanne, Monika and Anthea. They look so... demure here. But this is a supper club blog so let's throw some food in first. The starter was my French gnocchi with broad beans and pancetta. The pancetta was from F. Norman Butchers in Oakwood and wow, what a smoky delight it was. I've declared in the past my opinion of unsmoked bacon so I won't bore you again. Suffice to say that if you support the unsmoked bacon market you are Satan's spawn, so stop it. Unsmoked bacon is an offence to nature. Wonderful smoked pancetta cut into lardons. And in their starring role with French gnocchi and broad beans... and a leaf of home grown red veined sorrel. So, back to the gymnastics. Nikki had booked in a group of six, all of whom were NCT attendees two years ago. Certainly some alcohol was drunk but that itself doesn't explain what came to follow. Roxanne for some reason felt it was essential that the dinner guest create a post prandial human pyramid. Luckily seven months pregnant Kate had left by this stage. There was an issue though. 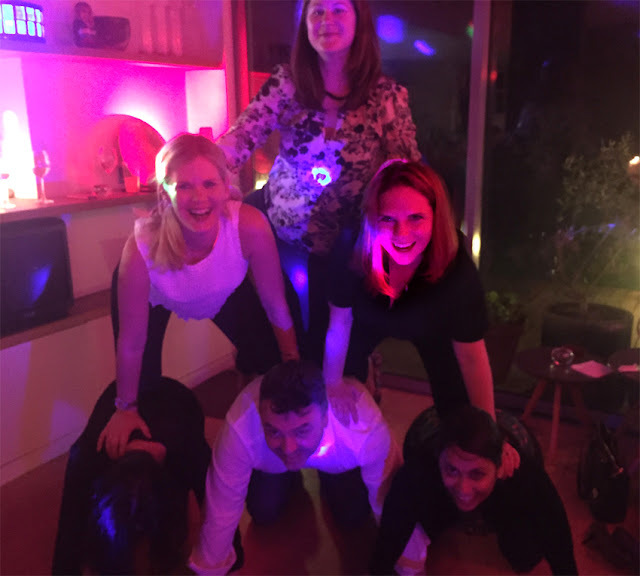 If I was pulled in to be the sixth member of the pyramid who was left to take the photo? Luckily, this weekend my old college friend Jon was visiting from Dublin. He was persuaded to be the centre. In rugby terms he would have been the prop. The irony was only a few hours earlier, Monika had told me she wasn't sure about dancing as she hadn't broken that mould with the group yet. Come midnight and that mould lay in tiny shards in my back room. You'll notice who gets top billing here. Mammaaaa... I just killed a man... put a gun against his head, pulled the trigger, now he's dead.